← In a Vase on Monday. The Last Trumpets. 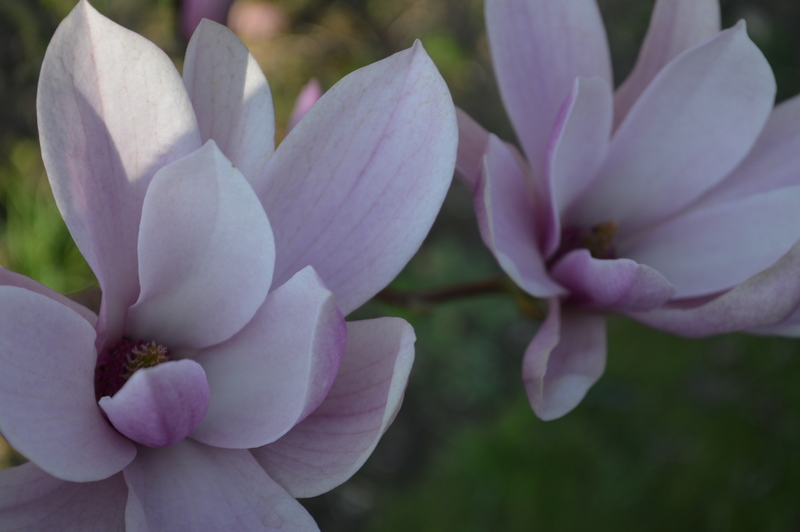 Really, magnolias should be at number one on my Top Ten April Blooms list because I am crazy about them, but I have been enjoying these six for a couple of weeks now and it is time to celebrate them before they go over. Besides, I want to join in with the popular meme, Six on Saturday. 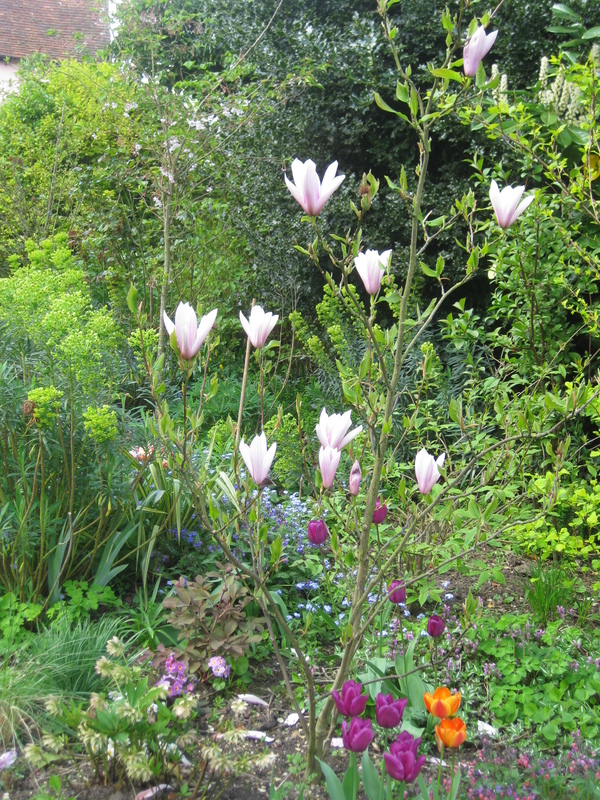 In my previous garden I had twenty three mature magnolias planted by the previous owner who had a nursery there. Every one had their lower branches pegged down into the soil so that they would put down roots and that is the most reliable and easiest way to propagate them. I did trying growing one from seed and after seven years wait the flowers were small and disappointing. Our present garden didn’t have one single magnolia when we came eight and a half years ago, but you can be sure it has now. At the last count there were eleven. I have heard complaints about the brevity of time of their blooming but if you plan them carefully you can have a succession of blooms for weeks. 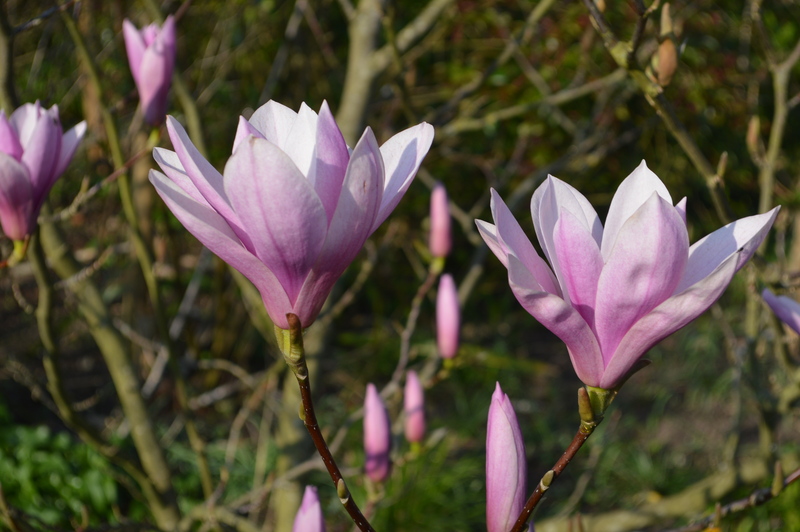 Magnolia soulangeana is one which you see in every garden, but not in mine, so I don’t include it in my six. It is beautiful but it takes up a lot of room and anyway it takes a few years to produce flowers and there are other varieties which I think are more interesting. Its early flowers are often ruined by frost. The ones round here are all looking brown and frost damaged now. In any case it takes many years to look as good as this one. The first magnolia into bloom in my garden is glorious ‘Leonard Messel’ with fluttery, tattery, pink petals. I planted this tree seven years ago and it already looks wonderful. ‘Leonard Messel’ blooms when very young and the flowers though early seem to be reasonably frost resistant. 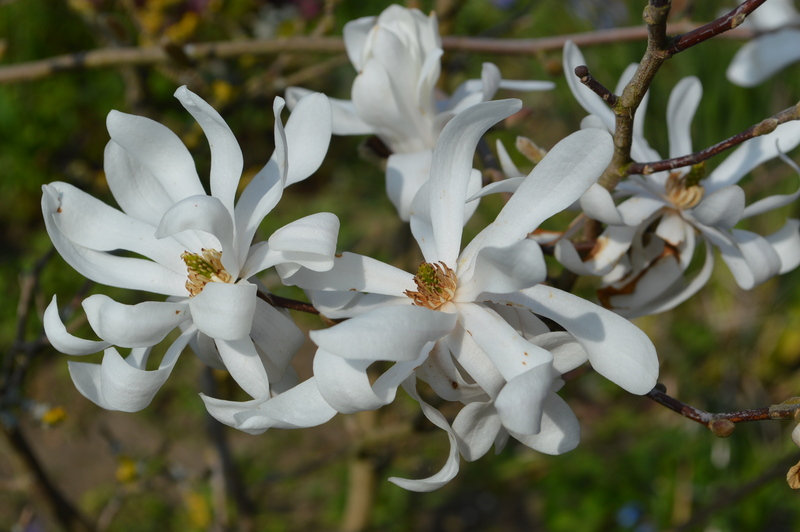 ‘Leonard Messel’ was bred from the starry flowered Magnolia stellata which I also have. This is a slow growing tree or bush which grows to about 2.5 metres so it is suitable for a small garden. Mine is a standard. I have already shown buds of my dark Magnolia ‘Black Tulip’. The flowers remind me more of water lilies rather than tulips. They are luscious deep pink goblets. I was worried the frost would damage them but they have survived quite a few frosty nights unscathed. My latest purchase is a white flowered one called ‘Wada’s Memory’. The flowers hang limply like pure white handkerchiefs or white doves if you have a more romantic turn of mind. I saw a mature one in the arboretum at East Bergholt last year and I had to have one. It grows to about 4 metres and makes a pyramidical shape which is covered in bloom. It is fast growing and blooms freely when young. Magnolia ‘Wada’s Memory’ East Bergholt. Magnolia ‘Wada’s Memory’. East Bergholt, Suffolk. Mine will take some years to reach this height but never mind, here it is, it looks lovely right now. I wish I had brought rooted cuttings of all my magnolias but I did bring a piece of one of them, Magnolia lilifora ‘Nigra’ and it is now a nice little tree. It is quite late flowering and has really dark flowers, not black as the name suggests but very dark pink. My favourite magnolia has huge long lasting, pink flowers. I first saw it at the late Princess Sturdza’s wonderful garden, ‘Le Vasterival’ near Dieppe in France. So many wonderful plants have come from here. 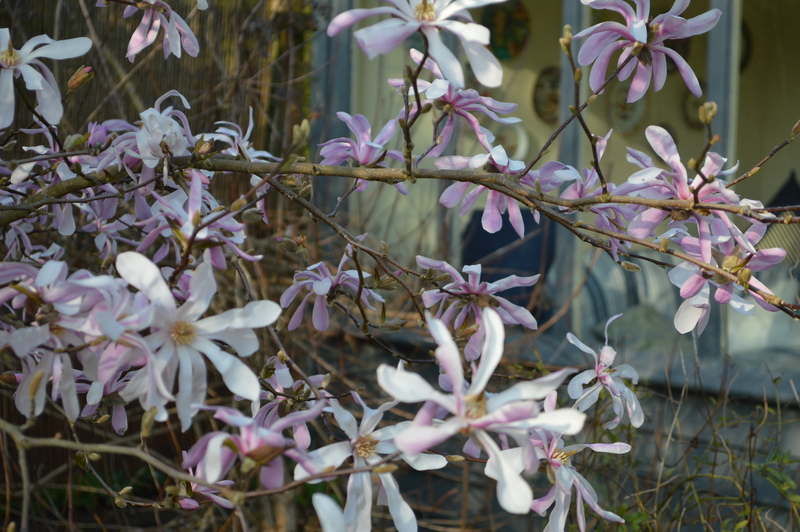 When I visited, Princess Sturdza said that ‘Star Wars’ was her favourite magnolia and I have to agree. Like many wonderful magnolias it was bred in New Zealand and was given its name because the tepals point in all directions. 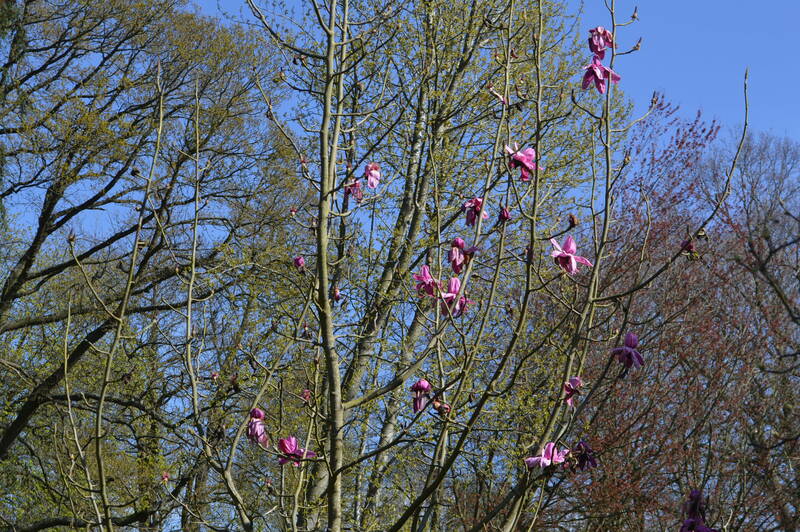 One parent was Magnolia campbellii which has the most enormous flowers, but in the UK it is generally only found in Cornwall because it is very early flowering and the frosts zap the flowers. It makes a huge tree and takes many years to produce its first blooms. ‘Star Wars’ flowers are almost as big but they are produced on very young trees. Here is my tree in its second year, 2012. I was delighted when it produced eleven flowers. Now it is looking wonderful and I can’t even count the blooms. I don’t have a garden with a view, but here I can use a bit of borrowed landscape in the form of the ancient Cedar of Lebanon tree in the Old Rectory garden, it makes a lovely backdrop. Magnolias like an acid to neutral soil and they hate root disturbance. They don’t take kindly to pruning. But really they are very easy and undemanding. After all, they have been around long, long before we were here. They were here when dinosaurs roamed the earth. In fact scientists have discovered that the very first flowers were magnolias of some sort. Can’t you just imagine a pterodactyl flying past this one in the arboretum at East Bergholt? Six on Saturday is hosted by The Propagator. Do join in with the ever growing group of bloggers celebrating it. Please join me on the 23rd April with your Top Ten April Blooms. It doesn’t have to be ten. Maybe you have four or five or just one stunning April bloom that we all should see. 44 Responses to Six on Saturday. Magnolia Magic. Magnolias are beautiful. Lovely scent too. Yes, I forgot to mention that some of them are lightly scented. You have a great collection although I can imagine you must miss some of the others you left behind. 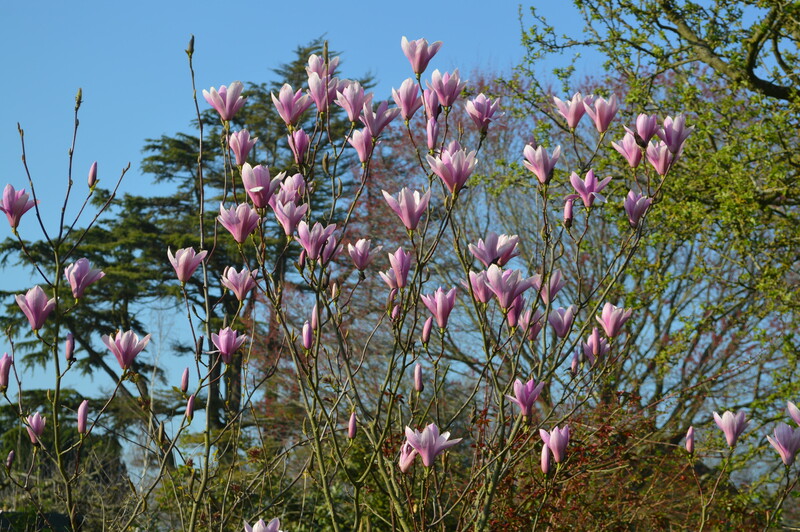 I noticed Magnolia ‘Leonard Messel’ looking good yesterday at Arley Hall. The flowers had survived the frost. Yes, you always miss the ones you left behind. 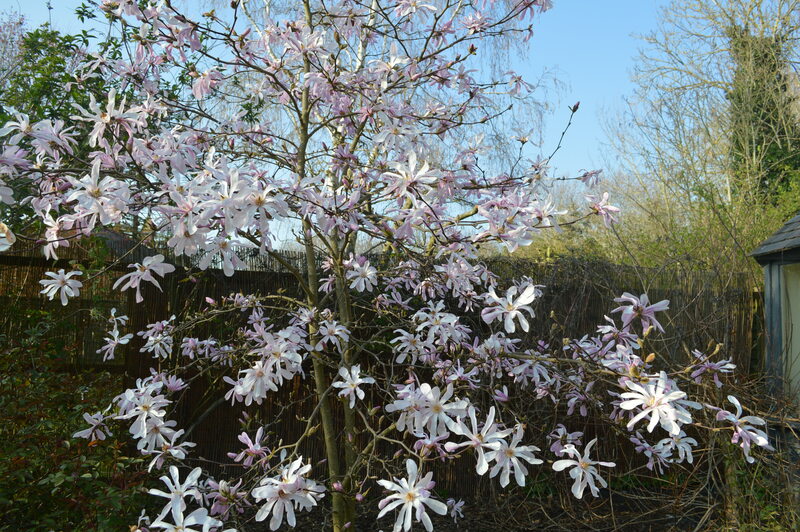 My biggest regret is a fine specimen of the May flowering Magnolia wilsonii. I can’t seem to get it established here. Yes indeed and I forgot to mention it. You have a really nice collection and magnolias really say spring is here. Yes I agree, spring wouldn’t be the same without them. I love all magnolias. My favourites are ‘Black Tulip’ and ‘Nigra’, but I also love ‘Leonard Messell’ and ‘Star Wars’. Well actually, all of them. I agree with you; they are the loveliest of trees. I find it difficult to pick a favourite but I think if I could only have one it would be ‘Star Wars’. But then I wouldn’t like to be without ‘Leonard Messel’. I always look forward to the first blooms but before they open I enjoy the plump furry buds, they look as if they are wearing suede jackets. 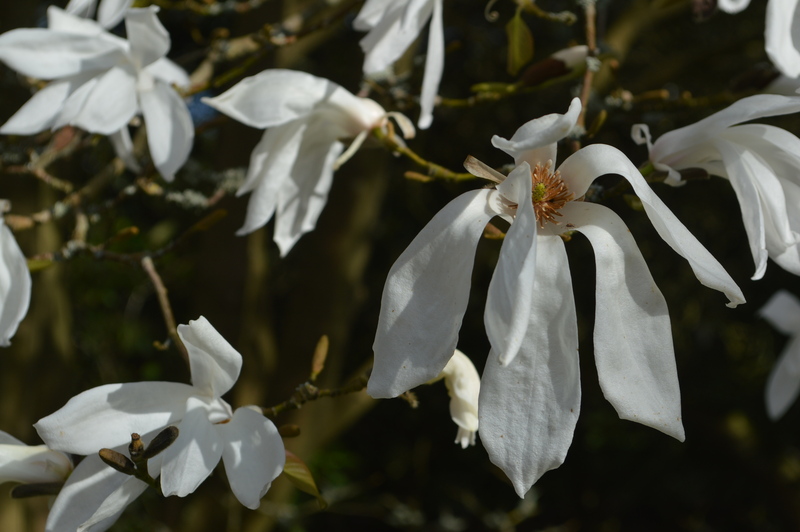 Since I entered the world of garden blogs nearly 10 years ago, I’ve been entranced with Magnolias, although the only species you generally find in my area is the Magnolia grandiflora, which can be a messy tree. (I inherited one with my current garden.) I’ve seriously considered investing in ‘Black Tulip’ but I don’t know where I’d put it and, as my soil is definitely on the alkaline end of the spectrum, I’m not sure I could make it happy. While I deliberate, I’ll enjoy your lovely collection. Most magnolias prefer a slightly acidic soil but they don’t get it here. It depends how alkaline you are. 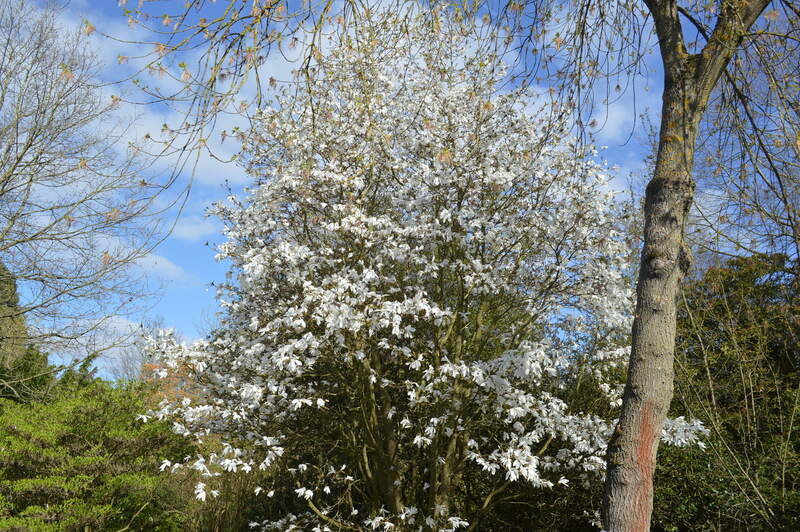 Magnolia stellata can cope with a slightly alkaline soil as long as you add plenty of organic matter. It must be kept watered though if you want it to bloom. 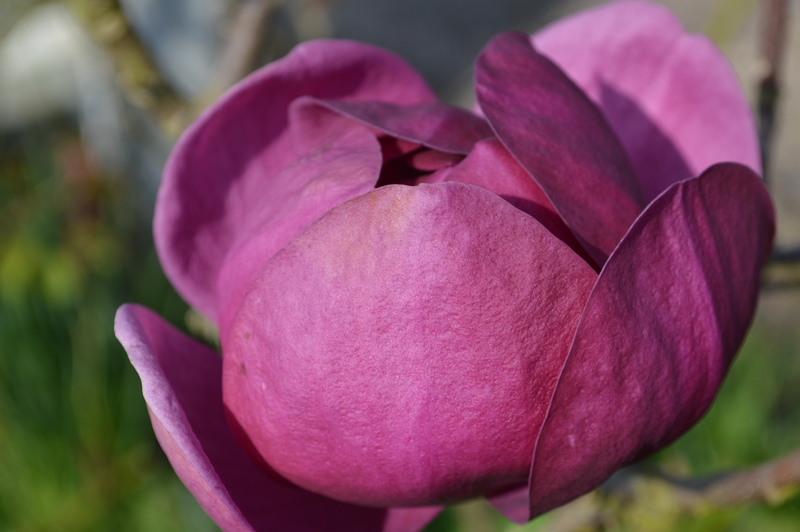 I do like magnolia flowers.. among yours, I think Black tulip is my favorite…I also grow a stellata and add a grandiflora in my garden would be great…I just have to find a place ! 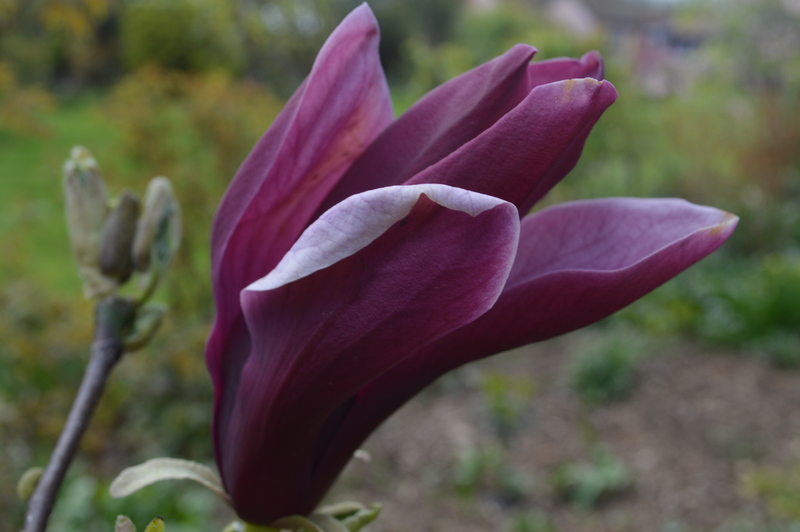 Magnolia ‘Black Tulip’ is certainly eye catching. I love the huge lemony smelling flowers of Magnolia grandiflora in summer but it does need a lot of room. Oh what beauties Chloris! I wonder what the collective noun would be for a collection of magnolias. I shall go to sleep later thinking of likely candidates. I noticed that Monty Don was enshrouding his ‘Black Tulip’ with fleece on GW last night but his tree is still relatively small. You’ve got me trying to think of a collective noun for magnolias now. A ‘Flamboyance’ perhaps or a ‘Magnificence’? 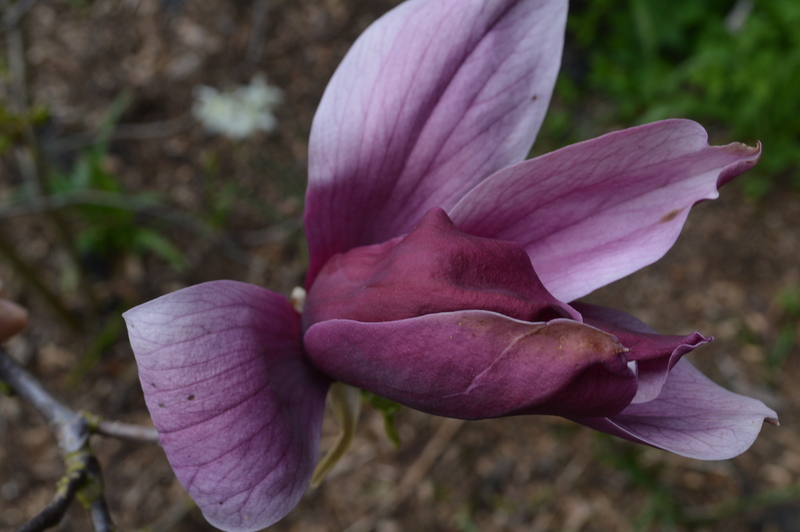 Black Tulip seems reasonably frost resistant at least compared with the ubiquitous M. Soulangeana. You have a wonderful collection, Chloris, and I think a large garden in which to grow them. I think I like ‘Wada’s Memory’ as I think there’s something very pensive about it, but really they are all gorgeous. 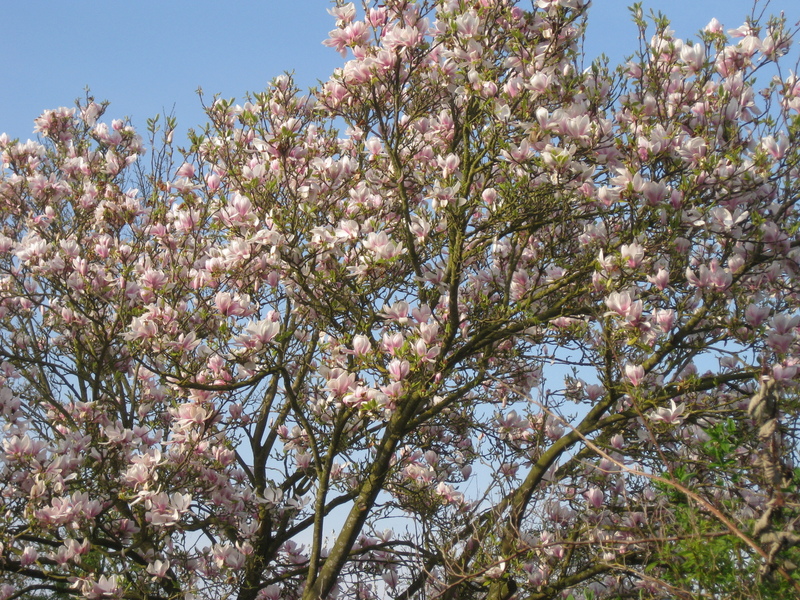 You have some lovely Magnolias, my favourite spring flowering tree. ‘Star Wars’ is fabulous. I think Lanhydrock is my favourite place to see Magnolias, but I have yet to visit Caerhays and may have left it too late this year. Cornwall is the place for magnolias. Of course you enjoy them earlier than we do down there. Lanhydrock is my favourite garden for magnolias, it is stunning. A lot of them don’t like to sit with their feet wet all the time. They seem to enjoy that well-known horticultural oxymoron, ‘moist, but well drained soil’. Yes, a succession of magnolias flowering would be a good solution to their individual short flowering periods – given the space! I just have Susan now, which is a form of M nigra I think. Star Wars is gorgeous! I have a smaller, compact magnolia which flowers later. Susan is gorgeous, one of the 8 Little Girl’ magnolias bred using pollen from Magnolia stellata on Magnolia liliiflora. I love it and would have featured it if I hadn’t been restricted by the number 6. Magnolias are all beautiful; in my ignorance I didn’t realize they were such an ancient species. I have a stellata, that I have to water all summer to be sure of any flowers the following spring. Oh yes, if they dry out too much in the summer they will not bloom the following spring. M. Stellata is so pretty. They are one of the joys of spring. Yes, it is an easy way to propagate.. Which one do you have? Such gorgeous trees deserve to have lasted since the dinosaurs! ‘Star Wars’ looks like a garden tree to dream of. All the magnolias are rather far down on my priority list here in Missouri because of our tendency for late cold snaps. Are there any you would recommend as being least likely to be turned to sad brown mush just as they are trying to bloom? I have found the flowers of M. Leonard Messel to be the most frost resistant. It’s worth a try. 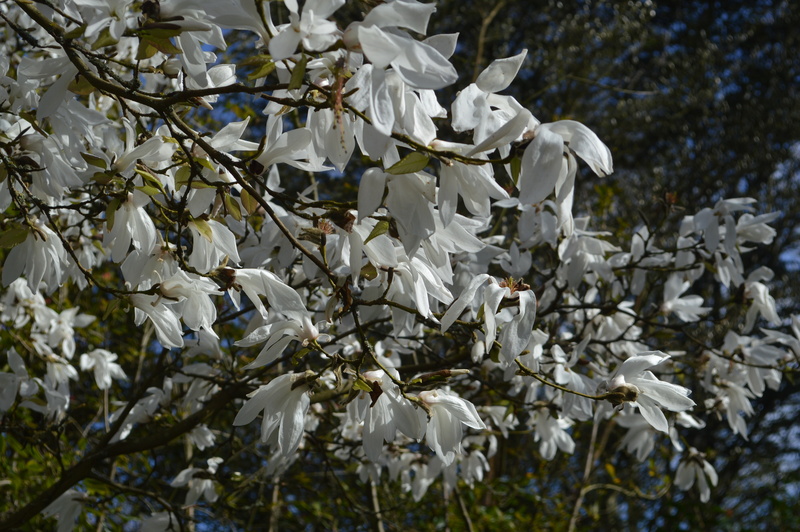 Or a May flowering magnolia such as Magnolia wilsonii which has deliciously fragrant flowers. Oh gosh, Magnolias are so special. It always seems like spring has truly established herself when the Magnolias bloom. The buds around here are plump, and just a few more warm days will help them to pop. Dreamy photos! They are special and watching the plump buds unfold is always a delight. I am glad that spring has finally arrived for you. They are beautiful aren’t they. I bet your precious garden was stunning at this time of year. My stellata is past it’s best now I’m afraid. March is its strongest month. I wish I had more room for Magnolias, I used to have five but am down to two and one of them is recovering from brutal pruning. I had ‘Star Wars’ but it split down the middle and the Lanhydrock tree has been broken by wind twice, seems rather brittle. Do you grow ‘Merrill’? I’ve found that fairly frost resistant and beautifully fragrant. Could I recommend that magnolia-lovers next spring go to the garden on Lake Maggiore planted by a distant relation of my husband? Villa Taranto was bought by the late Neil MacEacharn in the 1930s and – probably because of the lakeside micro-climate – has both the largest camellias and magnolias I’ve ever seen, and indeed more varieties of magnolias than I’d been aware of. The garden is open every day. I think my favorite Magnolia is M. stellata. There’s one a little down the street that is really lovely. My one criticism of Magnolias is that they tend to be single season plants. Fabulous! Love the Black Tulip, but it is my favourite only by a smidgeon, they are all wonderful. We used to grow magnolias back in the mid and late 1990s. However, I disliked growing them. We just were not set up for what they needed, and then, after all the work, the market for them was very limited. They do not like to stay confined for too long. That means that they must be sold as quickly as they become saleable! Those that did not sell prior to bloom waited around for a long time, and many eventually go too disfigured to sell. The stock trees out in the arboretum still look great though. We just do not grow many at all any more.